Enter the heart of Gallura with the Little Green Train, an incredible adventure through the stupendous countryside of the North of Sardinia. Travelling on the little green train along the stretch that goes from Tempio Pausania through the North of Sardinia to the sea at the Costa Smeralda, at Palau, means learning to appreciate the journey itself, something we’re no longer used to doing. The slow pace of this small and charming means of transport by rail gives us the chance to look out of the window and admire the scenery. A luxuriant nature which at this time of the year is all the more beautiful thanks to an astonishing combination of vivid colours, ranging from white to the brilliant red of the cistus to the yellow of the genista broom shrubs. The silence of the natural world is only interrupted by the sound of the locomotive as it travels along the island’s antique railway lines, in distant places inaccessible to modern traffic. Granitic mountain scenery interspersed with fertile valleys with olive groves, fruit orchards, holm-oak cork trees and luxuriant vines which produce the famous Vermentino di Gallura. Other areas are dedicated to grazing, with small herds of sheep spread out over the hills not far from the “Stazzi”, the typical rural Gallura dwellings, the mainstay of the peasant farming lifestyle for hundreds of years. It’s easy to fall in love with these landscapes. 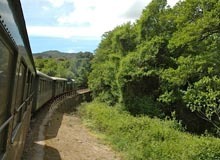 A traditional “chuff- chuff” announces the arrival of the train in one of the little stations set between tunnels and sharply curving spectacular viaducts, until the arrival at Palau, with its famous beaches and the picture postcard scenery for which Sardinia is famous world-wide.